Fredbear's Family Diner, often abbreviated simply to "FFD", is the name of the fictional location that is mentioned in Five Nights at Freddy's 2 and possibly makes appearances in Five Nights at Freddy's 3 and in Five Nights at Freddy's 4 from the minigames. Fredbear's is a family diner, reminiscent of ShowBiz Pizza Place and Chuck E. Cheese's, in that Fredbear's Family Diner provides entertainment via singing and dancing animatronic mascots. There are likely only two animatronics in the restaurant, possibly the springlock suits mentioned by Phone Guy. The primary mascot of Fredbear's Family Diner is Fredbear himself, accompanied by another animatronic who appears to be Spring Bonnie. The two characters are most likely the earliest incarnation of Freddy Fazbear and Bonnie respectively, as both characters have golden colors. In the book's alternate universe, Fredbear's Family Diner is in New Harmony, Utah and is described as a red building that functioned as a dance hall before William Afton and Henry bought it. As it probably is in the game it has two springlock suits, Spring Bonnie and Fredbear. Not much is currently known about Fredbear's Family Diner, although it is the setting of an incident in 1983, dubbed "The Bite of '83" by fans. According to Phone Guy in Five Nights at Freddy's 2, the restaurant was named "Fredbear's Family Diner", presumably a local family restaurant, before closing under mysterious circumstances. By the time the events of the second game occur, the diner and its owner have been gone for years. In Five Nights at Freddy's 3, Fredbear's Family Diner makes an appearance in the Stage01 minigame. It contains a single stage with what appears to be the springlock suits, mentioned in Phone Guy's calls from the third game. Finally, in Five Nights at Freddy's 4, the player sees a child getting bit by Fredbear, after bullies put his head into Fredbear's mouth. This incident has been dubbed "The Bite of '83" by fans. In Five Nights at Freddy's: Sister Location, when using the Breaker Panel on Night 2, the map-layout of the diner, along with the house from the fourth game's end-of-night minigames, can be seen on the left side of the monitor. The diner appears as a small rectangular-shaped building consisting two grey dots (representing Fredbear and Spring Bonnie from their stage). In the alternate universe of the novel, Five Nights at Freddy's: The Silver Eyes, the diner closes in 1982 after William Afton, the book's alternative to Purple Guy, dresses in Spring Bonnie and abducts (and most likely kills) his co-owner's son, Sammy. Although very little is known about them, there are two animatronics from the diner. Both of them are very similar to their counterparts, Freddy and Bonnie from Freddy Fazbear's Pizza, but with golden colors. Neither of these are confirmed to be Golden Freddy and Springtrap from the previous games, but until further evidence is brought to light, this is the most likely conclusion. Fredbear is possibly the original model of Freddy Fazbear, the vocal leader, and the mascot of Fredbear's Family Diner. He is a golden-colored bear animatronic wearing a purple top hat and bow-tie, and two black buttons on his chest. He has gray "metallic" eyes, thicker arms and legs, a squarish brown nose, smaller brown pupils, small white teeth, round ears with the insides colored in lighter shades, and a very circular-shaped stomach with yellowish shades. While his head appears to be separated into two parts being similar to that of Chica's old model from Five Nights at Freddy's 2, he is capable of moving his wide, toothy mouth up and down while singing. Like Freddy, he carries a microphone with his right hand. He seems to be taller than Spring Bonnie. From his picture as seen on the restaurant's wall from outside, Fredbear wears two black buttons, although the buttons from his actual sprite are missing (likely due to an oversight by Scott Cawthon). He is responsible for causing the bite incident portrayed in the fourth game, when the four older kids shoved the crying child into his mouth, causing him, either because the mouth to malfunctioned or because of his programming, to crush the child’s head. It was believed this incident could be the infamous Bite of '87 before it was confirmed that the fourth game is set in 1983. Interestingly, Fredbear is the only animatronic of the diner that was never discovered and reused for the horror attraction in Five Nights at Freddy's 3. It was technically unknown what happened to his suit after years when the diner shuts down, but it was assumed that his suit could be, perhaps, entirely lost after the events of Five Nights at Freddy's 2. It is speculated by some that Golden Freddy and Fredbear are one and the same. This is backed up by both animatronics being a suit with some wires/endoskeleton pieces. Both also have a golden color and a similar appearance to Freddy Fazbear himself. Some disagree using the fact that Fredbear has a purple hat and bowtie, and having a different height and width. Golden Freddy is also speculated to be one of the temporary replacement suits mentioned by Phone Guy on Night 4 in Five Nights at Freddy's 3. Though, Golden Freddy has four fingers while the Spring Bonnie springlock suit (Springtrap) has five, so Golden Freddy's suit is impossible to fit a human inside as he has four fingers rather than five. If this is the case, then Golden Freddy is possibly just a supernatural entity that does not have anything to do with Fazbear Entertainment while the disappearance of the real Fredbear springlock suit still remains a mystery. In the alternate universe of the book, Fredbear is a springlock suit, however, he is described as looking very similar to Freddy Fazbear, but yellow. From this, it can be inferred that unlike in the games, he has a black top hat and bow tie. Also in the book, Fredbear becomes Golden Freddy. William Afton, the book's equivalent to Purple Guy, uses the Fredbear suit while abducting at least one of the missing children. Spring Bonnie is an early model of Bonnie and the backup singer of Fredbear's Family Diner. He is a yellow rabbit animatronic being slightly shorter than Fredbear and wears a single black button on his chest. It is possible that Spring Bonnie wears a bow tie (as shown from his poster hallucination at CAM 02 and CAM 10 in the third game). His body structure is nearly identical to that of a human. He sports a pair of three-jointed ears and a round, fluffy tail which is seen while he's on the left side of the stage from the Night 5 minigame. Unlike his newer counterpart, Bonnie, he doesn't seem to carry a guitar, which could mean he is a backup singer, rather than a guitarist. In Five Nights at Freddy's 4, from the Night 3 end-of-night minigame, Purple Guy is seen putting a mask on the employee who is wearing the Spring Bonnie costume. In Five Nights at Freddy's 3 minigames, his springlock suit was later used by Purple Guy in the end-of-night minigame after completing Night 5. However, the springlocks inside the suit malfunctioned, resulting in his brutal death. Thirty years after this gruesome death, the suit had deteriorated into massive disrepair and was later known as "Springtrap". Springtrap was later discovered and used for Fazbear's Fright until it was burned down overnight because of the faulty wiring in the building after completing Night 6. Fredbear & Friends! is a television show aired on 1983. It consists of Fredbear, Freddy, Bonnie, Chica, and Foxy. This occurs in the end-of-night minigame after beating Night 1 if the player presses "ENTER" on their keyboard while in front of the television. From Party Room 4, some believe that the paper plate dolls of Freddy and Bonnie actually represents Fredbear and Spring Bonnie while the representation of BB's paper plate doll remains unknown, even though their colors are matched to Freddy and Bonnie. While it was unclear what BB's paper plate doll really represents, some even believe that it represents the odd-colored counterpart of BB (dubbed JJ or Balloon Girl by fans), as some speculated that it was BB's early design, although it is also unknown if BB's odd-colored incarnation appeared in Fredbear's Family Diner. Furthermore, some speculate that the "Take Cake to the Children" death minigame possibly takes place in the original Fredbear's Family Diner. Some theories also state that Shadow Freddy and Shadow Bonnie from the second game were the souls of employees who died in springlock animatronics, due to their "malfunction" from Fredbear's Family Diner. Furthermore, some theorized that both of the shadows represent Fredbear and Spring Bonnie respectively. From CAM 04 where the picture of a gold-frosted Cupcake replacing Toy Bonnie's picture on rare occasions, it was speculated by some that this drawing hints the golden-colored Cupcake to appear in Fredbear's Family Diner as the golden Cupcake, Fredbear, and Spring Bonnie having gold-like colors. However, it was unknown if the golden Cupcake really did appear in the diner, as a "diner" counterpart of Chica has never been seen. In the minigames, the player gets to see what is likely Fredbear's Family Diner in its full size for the first time. It appears to consist of many features possessed by a normal Freddy Fazbear's Pizza, such as a Show Stage and Backstage. The restaurant's animatronics consist of the springlock suits mentioned by Phone Guy in Five Nights at Freddy's 3, which include Spring Bonnie and Fredbear. Before Five Nights at Freddy's 4 was confirmed to take place in 1983, many fans believed it to be set in 1987. Like Freddy Fazbear's Pizza, Fredbear's Family Diner is reminiscent of, and could have been inspired by, Chuck E. Cheese's, a real-life family entertainment center that also sells pizza, caters parties, and features an animatronic band of singing mascots (Munch's Make-Believe Band). It could also be a nod to ShowBiz Pizza Place, a similar restaurant that also had an animatronic band (the Rock-afire Explosion) which contained a guitar-playing bear named Billy Bob. Fredbear's could quite possibly be the sister location mentioned in Five Nights at Freddy's 3, as it contains the springlock suits mentioned during Phone Guy's calls. On Night 2 of Five Nights at Freddy's 3, Phone Guy says: "As always, remember to smile; you are the face of Freddy Fazbear's Pizza." confirming that the springlock animatronics are actually part of the Freddy Fazbear's Pizza franchise regardless if the location is Fredbear's Family Diner. The name "Fredbear" may be a nod to the development of Five Nights at Freddy's, as in the alpha and beta stages, Freddy Fazbear was then called Freddybear. This can be seen in the game's internal code, as well as the kickstarter page for the very first game. From the fifth teaser for Five Nights at Freddy's 4 featuring Nightmare Fredbear's hat and bowtie, when brightened, text becomes visible on the bottom right. The text reads "Property of Fr - er". Some believe that this is "Property of Fredbear's Family Diner". Others believe that the letters wouldn't match if it were true. Instead, they suggest the teaser actually says "Property of Freddy Fazbear's Pizzeria". In the Halloween Edition, Fredbear's Family Diner has Halloween decorations such as bats, cobwebs and a more Halloween-themed coloring. The music that plays during the Stage01 minigame in Five Nights at Freddy's 3 is Swan Lake Ballet by Pyotr Illych Tchaikovsky. In The Freddy Files, there is an obvious error referring Fredbear's Family Diner as Freddy Fazbear's Pizza instead. This was most likely done to keep the lore anonymous. Golden Freddy (or possbly Fredbear) in the "Stage01" minigame (click to animate). Spring Bonnie in the "Stage01" minigame (click to animate). Texture for the outside of Fredbear's Family Diner. 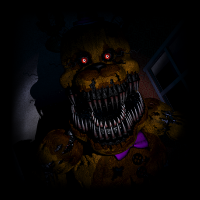 A poster of Fredbear, which appears in the end-of-night minigames for Nights 2, 3, and 5. The suit in the backroom of FFD in the minigames.